The deadline for speaker submissions has been extended to end of day Saturday, March 31. 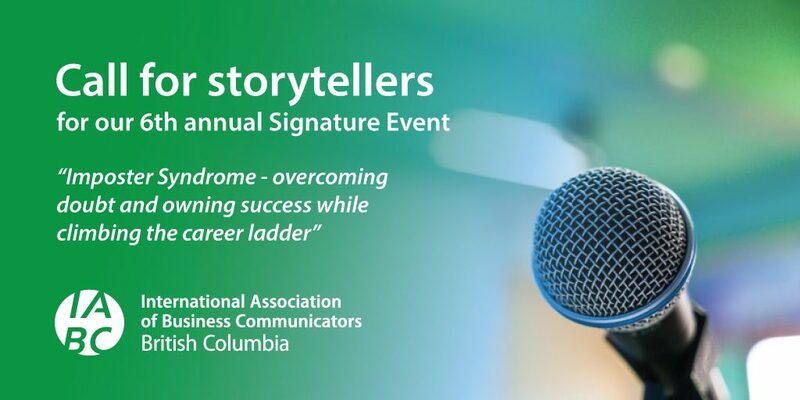 On April 19, 2018, IABC/BC will host its 6th annual signature storytelling event—an inspiring and entertaining evening of communicators sharing their career stories. Even the most accomplished communicator has moments of feeling like a fraud. Success can prompt uncertainty: Do you belong at the table? Are you cut out to lead the team? Did you deserve that promotion? Are you adding value? Pushing through these moments of self-doubt can be hard – and we want to hear your stories! If you’re a local professional communicator and have an authentic five-minute story to share about tackling imposter syndrome at work, want to hear from you by end of day Saturday, March 31. You must be available to attend the event on Thursday, April 19th. Your talk should be no longer than 5 minutes. Our panel will select up to 8 speakers. While being an IABC/BC member isn’t a requirement it will be a factor in the selection process. To apply, please send an email to: pdevents@iabc.bc.caFor inspiration, check out our speaker videos from previous events. Videos courtesy of IABC/BC video production sponsors Basetwo Media.